After having spent many years holidaying in Mijas with her parents, Zara had always dreamt of a fairytale wedding in Spain. A date in June had been set to ensure maximum daylight and where the temperature would be perfect for a summers wedding in Spain where she would marry Lee. Zara had a vision of getting married in Spain in traditional style and to keep the theme and culture of the country running throughout her day, so the search began for a true Spanish wedding venue in Spain. 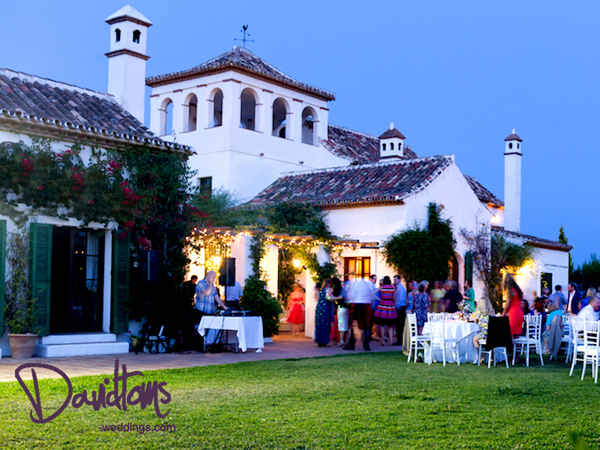 Her parents toured several venues but once they had seen the Hacienda in Mijas they knew this was the perfect location for their daughter to get married in Spain, and for their guests to join them, with only a 20 minute drive from Malaga airport. As their friends and family were travelling abroad, Zara and Lee wanted to make sure they were catered for, so they planned a “welcome party”, followed by the “wedding day” and then a “post party” so they could say thank you to everyone for joining them before their guests either headed home or to carry on their holiday in Spain. The welcome party was set on a beach, on a lovely warm night, where guests enjoyed a tasty Paella & sipped on cool jugs of sangria. They all sat around chatting and introduced themselves to one and other whilst listening to the sound of the Mediterranean Sea and watching the most amazing sunset. What a fantastic way to start Zara & Lee’s wedding in Spain! Everyone was so excited for the villa wedding in Mijas Spain, and so the day arrived. Finally after so much planning with the Sunshine Weddings Spain team to make sure their Spanish theme was felt from the start. Spanish music was played from the arrival of the guests who were serenaded to by a Mariachi style trio whilst the bride made her entrance to a classical guitarist who performed throughout the ceremony. The wedding guests then moved to the internal courtyard to listen to a flamenco style guitar and enjoyed a selection of drinks and Spanish canapes. The wedding banquet was presented in vintage decoration and style with specially designed table arrangements, which were complimented with chaivari chairs and a beautifully designed guest book for everyone to sign. After dining outside under the stars, guests watched the couples first dance and partied into the night experiencing Lee & Zara’s beautifully Spanish themed and romantic wedding in Spain. The following day guests were invited back to the wedding villa in Mijas to enjoy a relaxed BBQ laid out by the pool. After months of planning Zara and Lee’s dreams had come true not only did their guests have the time of their lives but they too experienced the most amazing 3 days of celebrations with the fondest of memories of their truly wonderful wedding in Spain.